With one goat, a wheelbarrow, £1,000, and three small children, Graham and Josephine Townsend uprooted their comfortable lives in Sussex 26 years ago to pioneer a cheese-making business in the countryside near Tiverton. The move was risky, but it paid off. Today, Vulscombe's creamy goat's cheese is one of our most popular Goats cheeses. Despite its huge commercial success, Vulscombe Cheese is still a small cottage industry, where Graham and Josephine, together with a few part-time staff, carefully do everything by hand. From mixing the fluffy white curd with fresh green herbs, to wrapping and labelling the finished product into pretty little logs and rounds, this is a hand made. "We came here in 1982," says Graham. "I was a university lecturer and resigned from a perfectly good lectureship to come and do this. It was a wish and a bit of a gamble. "Jo and I were at Oxford together and when we got married we both knew we would do something daft like this one day. "Jo is the one who holds the place together. She is the brains behind the enterprise." Setting out, Graham and Josephine arrived in Devon with a detailed idea of what they had to achieve. "When we lived in Sussex we had one goat, and even a pretty poor goat will give 200 gallons of milk a year, so we had already experimented with making cheese," said Graham. "I talked to a lady who had kept goats for a very long time and modified her recipes to suit our needs. Before we left, we knew we had a cheese with commercial potential. We built up a herd and started production. We didn't hang around. It was important to get the cheese established and make a success of it because we had three small children." Graham and Josephine now churn out 60,000 to 70,000 cheeses a year, and they say demand is so high that this figure could easily be tripled. "If we had put a sign in the drive saying goat's cheese, people would have laughed. This is dairy country and no one ate goat's cheese here 26 years ago. Now that has all changed." Vulscombe cheese is quite firm, very mild and creamy. 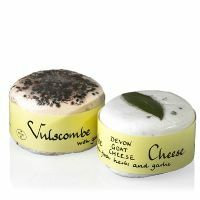 Unlike many goat's cheeses, which can often be a trifle pungent, Vulscombe has a rich, yet delicate flavour. "It's deceptively creamy and that's because it's made using a slow method called the acid curd process," said Graham. "We don't use rennet so it is also suitable for people with cow's milk allergies." The cheese comes in four varieties — pepper, fresh herbs and sun-dried tomatoes, herb, and plain. "All of the herbs are grown on the farm and picked by us on the day, even in winter," said Graham. "Up until 2006, we had our own magnificent herd of goats, which we reluctantly sold because it was just too much pressure for us. "The milk is still local though. We get it from a chap in Rackenford. He delivers it at 8pm and it goes into our bulk tanks. Then, at 4.30am the next day, we pasteurise it and add the starter — a culture that makes the milk sour very slowly. "The milk is incubated for 48 hours to curdle and then the curd is strained in muslin and cheese cloth. We weigh it, add herbs and spices, press it, and package it." At 27 per cent, Vulscombe cheese is comparatively low in fat to other varieties. Cheddar is about 45 per cent, and brie around 60 per cent fat. Making cheese is demanding, but Graham and Josephine enjoy what they do and don't intend to throw in the towel any time soon. "It's a continuous process, very labour intensive and you never stop," said Graham. "I start here at 4am and finish at 10pm seven days a week. But we love it and we live in one of the most beautiful places in the country. Above article from "This is Exeter.co.uk"